Gallaudet University, spanning 99 acres of Northeast Washington D.C., has been educating deaf and hard-of-hearing students for more than 150 years. DeafSpace Guidelines include more than 150 distinct architectural design considerations. 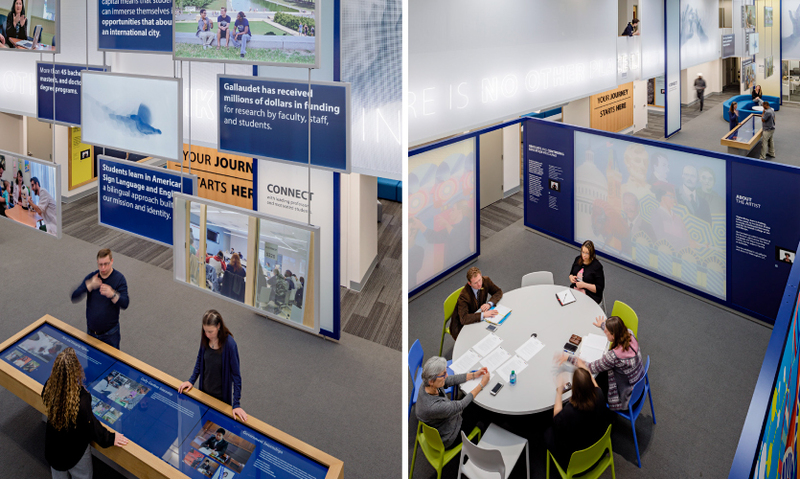 Hanging aluminum-framed scrims and lightboxes of varying shapes and sizes throughout the space reveal the university’s mission and tagline, and provide snapshots of student life. Gallaudet’s brand slogans were created in neon tubing that fuse light, legibility and visual clarity. 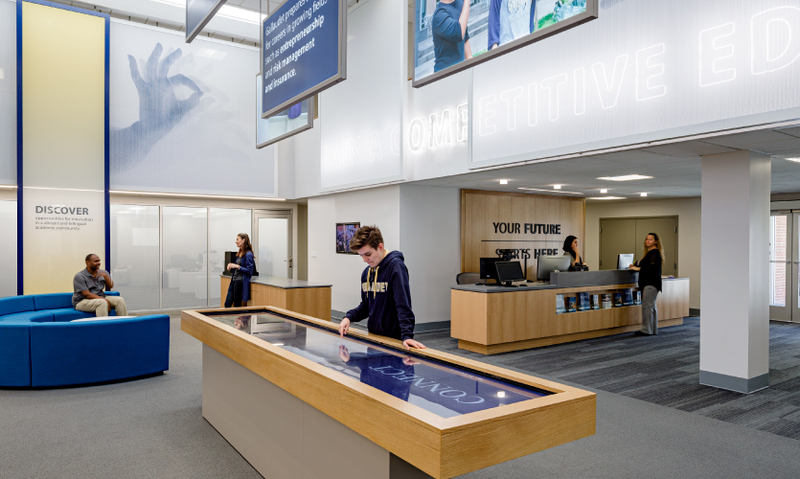 In the center of the space, a large touch-table provides relevant information on tours, academic offerings and student access to amenities. Yiqiao Wang’s brightly colored commissioned artwork has been printed on fabric that wraps the exterior of the conference room. 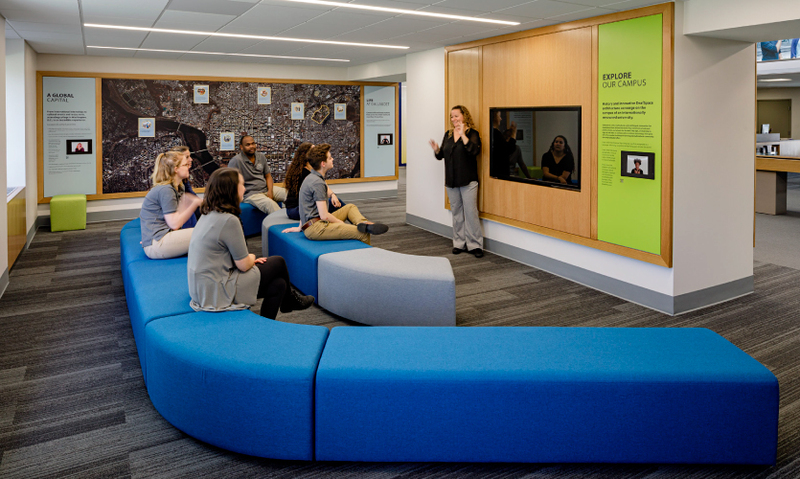 The C&G team also worked very closely with an accessibility team over the quick eight-month project on how to present the welcome center information for hearing and visually-impaired visitors in addition to deaf guests. To create “Connect,” each of the 40 hand movements used to sign the word were individually photographed and composited into a single image inspired by of the work of pioneering photographer Eadweard Muybridge. he artworks aptly illustrate the complex dynamics of sign language in an artistic and meaningful way. 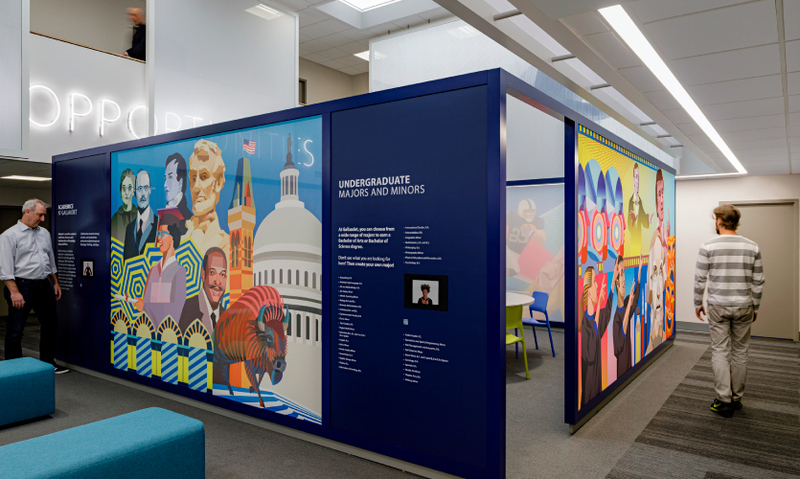 C&G Partners (New York) designed the Maguire Welcome Center visitor experience at Gallaudet University in Washington, D.C. for “deaf eyes” using DeafSpace Guidelines in partnership with the university and Dangermond Keane Architecture. Gallaudet University, spanning 99 acres of Northeast Washington D.C., has been educating deaf and hard-of-hearing students for more than 150 years. Alumni of Gallaudet’s bilingual (American Sign Language and English) undergraduate and graduate programs from around the world have become leaders and innovators in fields from law to technology. The university has been experiencing a period of aggressive growth and has significant plans to expand as well as integrate into the surrounding community on 6th Street across from Union Market, close to the hot neighborhoods of NoMa, H Street Corridor and Ivy City. Part of the new and exciting development on campus seems due in part to a human-centered and inclusive design revolution: the DeafSpace Project. The DeafSpace Project was a five-year-long collaboration, which began in 2005 between the ASL Deaf Studies Department at Gallaudet and architect Hansel Bauman. In addition to subsequently becoming an adjunct faculty member and official university architect at Gallaudet, Bauman is also Co-Director of the DeafSpace Institute. DeafSpace Guidelines include more than 150 distinct architectural design considerations that address five vital touch points of the deaf experience to the built environment: light and color, sensory reach, space and proximity, mobility and proximity and acoustics. Many considerations enable easier communication in ASL. Matte surfaces, modulated natural light and colors that contrast with skin tones can all reduce eyestrain and increase legibility, while including wider hallways, automatic sliding doors, ramps and curved seating areas all encourage uninterrupted conversation. According to the DeafSpace principles, a soft, diffused light “attuned to deaf eyes” is essential. 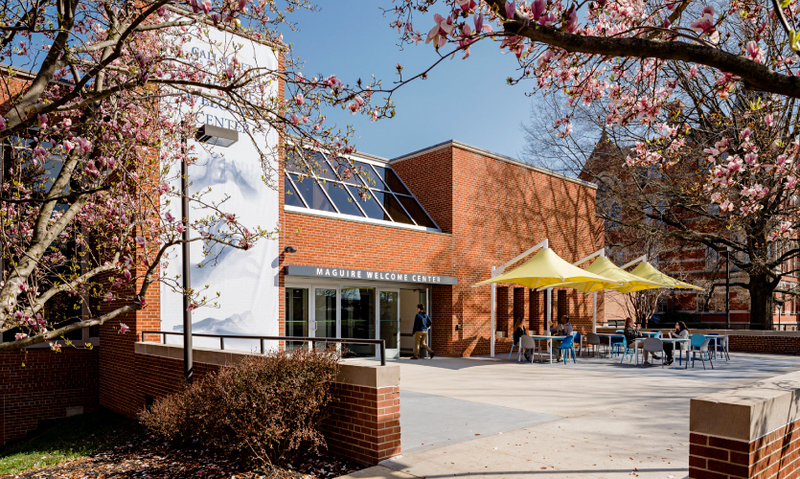 In the summer of 2017, planning for a transformational DeafSpace renovation to the visitor and admissions center had begun between Gallaudet University and Dangermond Keane Architecture (Portland, Ore.), who brought on C&G Partners to create an engaging new visitor experience to serve as a gateway to the school. The new Maguire Welcome Center facility would serve as a multi-use gateway to the university by adding a café, student lounge and conference center to its functionality. The C&G Partners design team began by immersing themselves in the culture of the deaf community and the DeafSpace Guidelines. The interior design for the space centered on the use of translucent scrims for multiple purposes: to modulate light, provide privacy for offices on the mezzanine level without sacrificing lines of visual communication, to communicate with interpretive content and branding, and to create visual connection between the conference room and the remainder of the space. The C&G team also worked very closely with an accessibility team over the quick eight-month project on how to present the welcome center information for hearing and visually-impaired visitors in addition to deaf guests. These strategies included video ASL translation, tactile controls, QR codes and a strong focus on typography size, height, weight, line spacing and contrast to achieve maximum legibility. 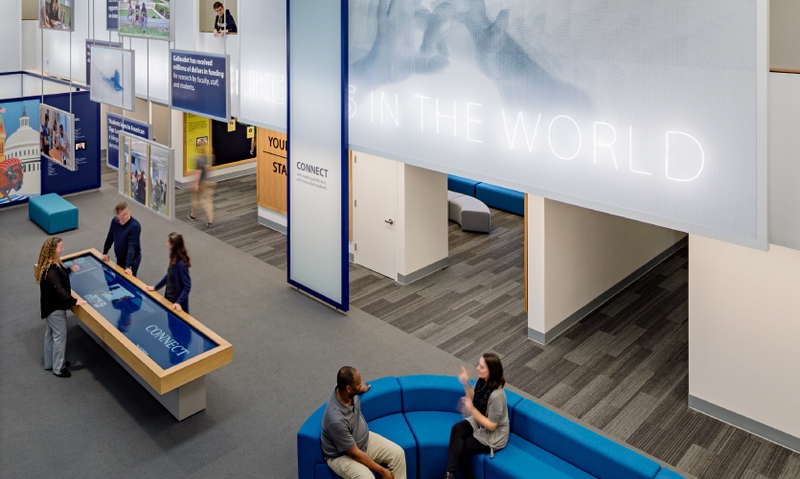 Hanging aluminum-framed scrims and lightboxes of varying shapes and sizes throughout the space reveal the university’s mission and tagline, and provide snapshots of student life. 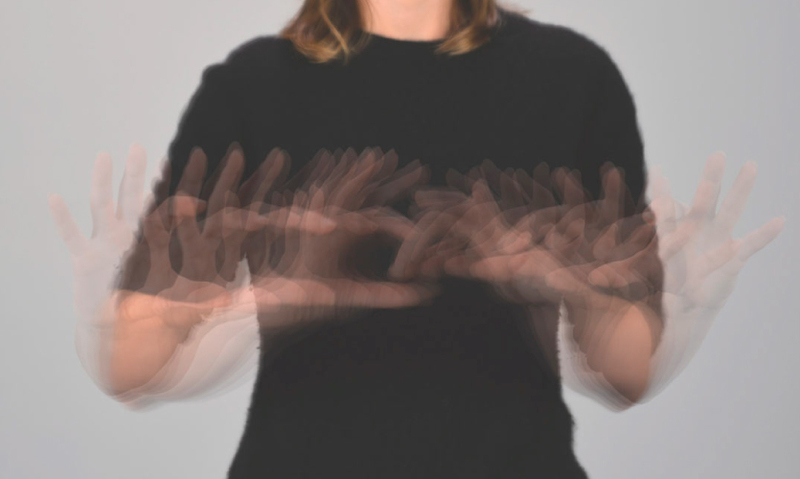 The words “Welcome,” “Connect,” “Discover” and “Influence” were also rendered as photographic artworks in ASL. 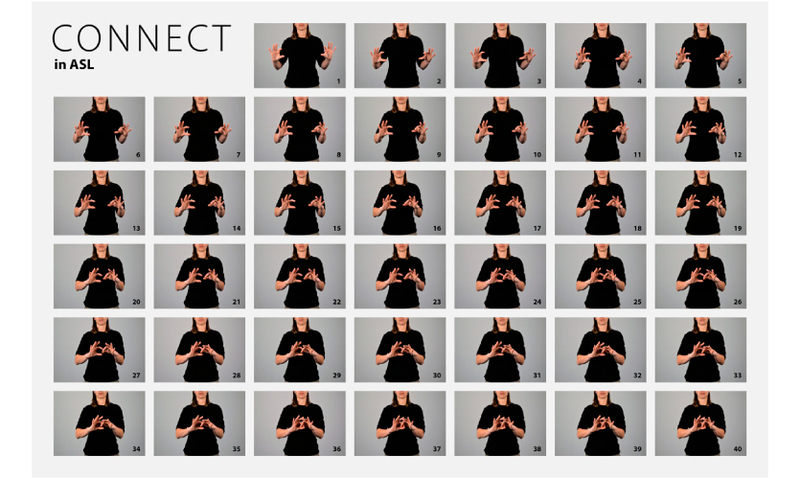 To create “Connect,” each of the 40 hand movements used to sign the word were individually photographed and composited into a single image inspired by of the work of pioneering photographer Eadweard Muybridge, whose early scientific experiments used the camera to sequentially record motion. The artworks aptly illustrate the complex dynamics of sign language in an artistic and meaningful way. The images were printed in a variety of sizes as large as 10 by 30 feet long. To ensure optimum legibility and visibility, the layered photographic images were converted into graphic art made of exaggerated halftone dots. Visible on the wall behind the scrims, Gallaudet’s brand slogans “There is no other place like it in the world," “gain a competitive edge with global opportunities" and “A bilingual, diverse, multicultural institution” were created in neon tubing that fuse light, legibility and visual clarity. Translucency was important for the conference room as well, where deaf artist Yiqiao Wang’s brightly colored commissioned artwork has been printed on fabric that wraps the exterior. From the inside, the artwork is visible, but diffuse. This exterior was also an opportunity to communicate majors and minors of the graduate and undergraduate programs. 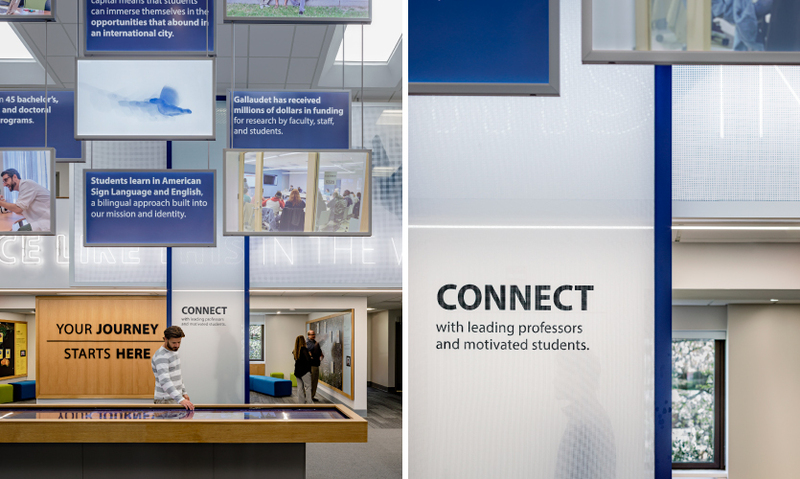 In the center of the space, a large touch-table provides relevant information on tours, academic offerings and student access to amenities via written text and QR codes for mobile, with ASL versions of the text on the surrounding eight iPad stations. Another large screen presents a campus map. All design elements were created with a focus on inclusivity, accessibility and creating a barrier-free space for shared experiences.